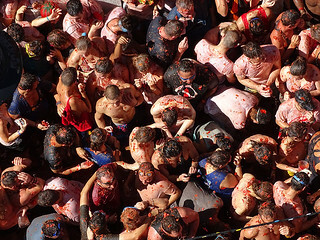 It was a shock for me when talking to a foreigner about ‘La Tomatina’ festival, he did not understand what I meant. I was sure my English was good enough to be understood and I preferred to suppose he did not know what I was talking about. And I finally realized I was right, he had never ever heard about it before. Please, do not misunderstand me. It is not that I think the ‘Tomatina’ is such a good and enjoyable festival that everyone has to know it, that is not right. But, at this point, and taking into account that similar festivals are being celebrated in other continents, I did not expect to meet someone who had no idea about this messy festival. I want to apologise for the mistake. It turns out that the ‘Tomatina’ is not the center of the world, hehehe. Therefore I will start by explaining briefly what this festival is about. The ‘Tomatina’ is a festival in which a tomato-fight is played out. It is held on the last Wednesday of August in the Valencian village of Buñol. Although it is just a small part of the Patron saint Festivities of the town, it has become the highlight of the week-long festival. It is celebrated in the main street of Buñol over one hour, where only tomatoes are allowed for the fighting. It was declared a Festival of International Tourist Interest in 2002. Apart from the ‘Tomatina’, the “Mano a Mano Musical“, performed by the two marching bands of Buñol, also plays an important role in the Buñol festival. Of course, nothing to do with the tomato fight, this one just at a local level. Dressed in orange T-shirt are the volunteers who go in the truck throwing the tomatoes after being smashed to prevent any damage. What did it trigger this messy festival? It is said that in 1945 a small fight was set off when people were attending the giants and big-heads ‘fiesta’. A market stall of vegetables which was nearby collapsed due to the pressure from the crowd and people started to pelt each other with the vegetables. This was the beginning of this festival which, in spite of being banned for several years, it never ceased entirely. In order to prevent any mishap and to control the number of participants, since 2013 it is mandatory to pay a fee for enjoying ‘la Tomatina‘. These entrance fees are sold out very quickly, but, in case you are late and you do not want to buy a package travel click here, be aware that some tickets are left for sale in Buñol on the day of the event. On the night before the Tomatina, the long main street of Buñol is packed with action. Like a long dining room full of tables on both sides, neighbours and some visitors sit and have dinner while people from different cultural backgrounds, nationalities and religions walk around. What surprised me the most, was the fact that a lot of asiatic people where there, interacting with Buñol´s inhabitants. Later I became aware that a twinning with a Korean city brought the Mud Festival to Buñol, as a festival exchange.